Cattle drive adventures not only test your mettle in the saddle, but also offer an opportunity to bond with ranchers, animals, and experience a truly American way of life. If you really want to test out your cowgirl skills, sign yourself up for a cattle drive adventure. Not only will you have the chance to play outdoors on horseback for multiple days, you’ll be challenging yourself to learn something new, enjoying an active vacation and actually helping out a rancher in a real, measurable way. I’ve driven cattle in New Mexico, Colorado, Uruguay, Texas and beyond, participating in everything from city slicker-type drives put on for the benefit of us tourists while doing the necessary tasks at authentic working ranches. I tend to prefer the latter, which today, are harder to find. Many ranches have traded horses for trucks, hauling cattle instead of driving them. If you’re a cowgirl searching for real cattle drive adventures, check out these interesting experiences that allow guests to participate and remember, if you do choose to take this challenge, be prepared for a lot of riding. Get your muscles into riding shape, slather on the sunscreen and giddy-up. You’re in for one cool ride! Colorado Cattle Company & Guest Ranch in Northern Colorado, where we filmed for Equitrekking and participated in a cattle drive, is a real working ranch experience where cattle drives are a necessity. The terrain here is relatively flat and grassy with an outcropping of canyons not far from the main ranch, meaning there’s lots of room to roam and ride. While I helped mend fences, learned roping skills and gathered cattle off the range, guests might also brand calves, check on things like water and salt and can enjoy around 50 hours in the saddle during their week! That’s a lot of saddle time. Be prepared for work at this cattle ranch, which includes instruction from pro cowboys and cowgirls and features cozy cabins to snuggle into at the end of each day. 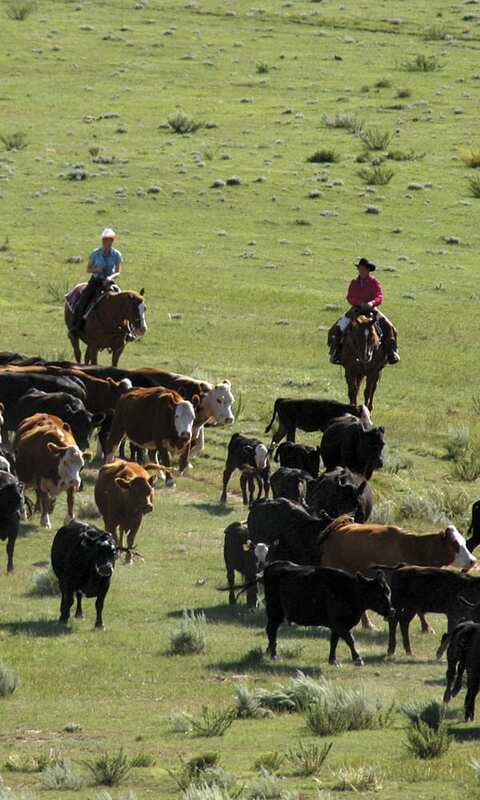 The Hideout Lodge & Guest Ranch is a large working cattle and horse ranch in Shell, Wyoming, that offers cattle work for all levels of riders from beginning to advanced. Depending on the season, you may ride through BLM pasture looking for strays, into the Cloud Peak Wilderness, or high up into the mountains. 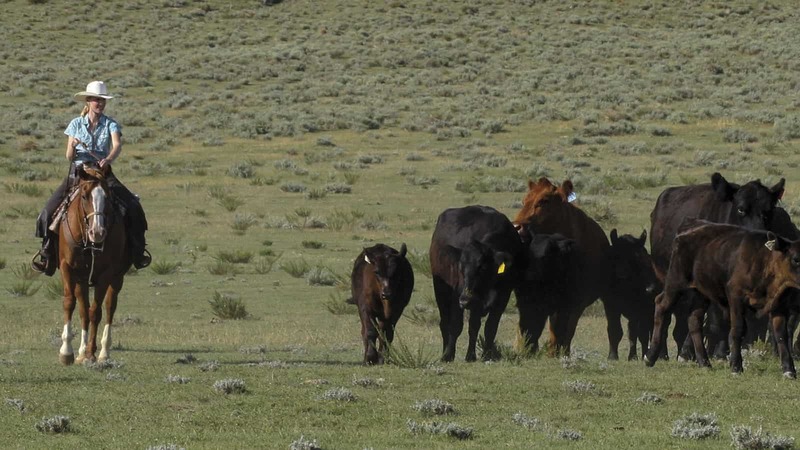 For over 101 years, generations of the Hunewill family have had their annual fall cattle drive, leading cattle from their summer ranch in Bridgeport, California down to their winter ranch in Smith Valley, Nevada. Up to 25 guests saddle up the second week of November to drive around 600 mother cows through canyons surrounded by dramatic tall mountains, along the Walker River, to their ranch in Smith Valley’s wide open sagebrush and high desert terrain. Many of the same guests come year after year to participate in this special adventure. Encompassing a branch of the old Santa Fe Trail and an area where in the 1800s Charles Goodnight is thought to have grazed his cattle, the vast Chico Basin Ranch near Colorado Springs is a real working ranch that takes only a few guests at a time to experience life on the range, where moving cattle to conserve and improve the grasslands is the main objective. When you come to work cattle here, you may learn a bit about land conservation too. In 1992, the state of Colorado brought the 87,000 acres where the ranch stands today and preserved it in a trust managed by the state. They later leased it for a 25-year term to cattle rancher Duke Phillips and his wife Janet. It’s a unique project, combining a working cattle ranch with a mission to educate the public and preserve area wildlife and Western ranching traditions. When guests travel to Chico Basin Ranch, many settle in for anywhere from three days to five weeks. 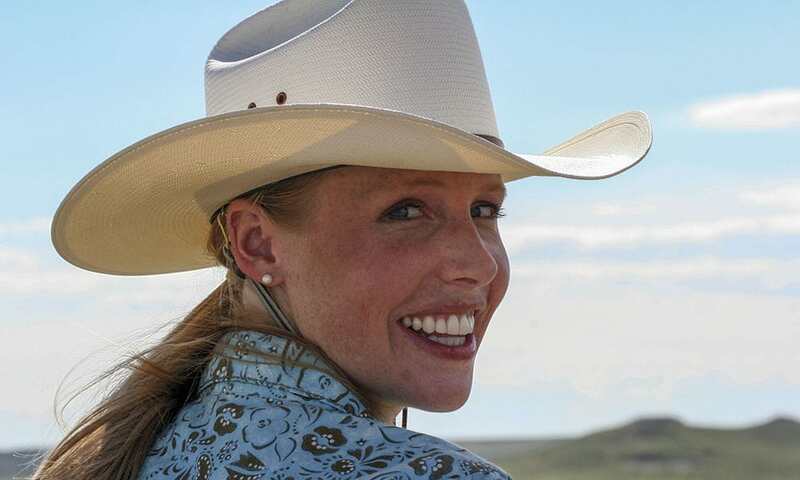 They eat with the cowboys, work with them, and are integrated into life on the ranch. The day-to-day tasks are real, such as gathering pastures, moving cattle from one pasture to another, weaning a calf and branding. The real deal progressive cattle drives! Doublerafter Cattle Drives is already filling up their summer weeks, as this is a truly unique, old school cattle drive vacation. Just like they’ve been doing for over 120 years, guests join real cowboys from the Doublerafter’s working ranch to travel 8-12 miles a day over varied terrain and elevations to move cattle to summer grass. Sleeping in tents and eating Dutch Oven meals cooked over hot coals, you’ll have ridden between 40 and 50 miles through the Big Horns by the end of the week. Moore Ranch in Kansas has several cattle drives in the spring and fall. This real working ranch is located in Southwest Kansas, less than an hour from historic Dodge City. Guests drive Longhorn cattle–– trotting, loping, cantering, or galloping as necessary through the prairies––and sleep under the stars or in cowboy teepees. The Bar W Guest Ranch in Whitefish, Montana offers special spring and fall cattle drives that culminate with a ride along the Canadian border. Guests ride through the Blackfeet Reservation to a base camp and then gather up the cattle, drive them back to the corrals, sort the mother cows and calves and then brand, inoculate, and doctor the young males. This is a ride that will definitely teach you new skills! Whatever cattle drive experience you choose, be prepared to meet some of the hardworking people who help put food on America’s tables and be prepared to experience a way of life that’s certainly special in America.